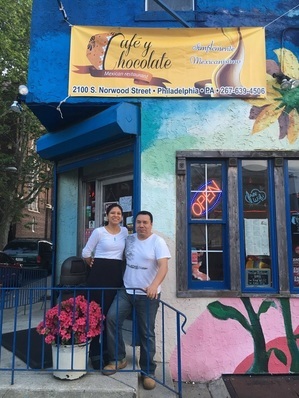 Mary Tellez and Arturo Lorenzo, co-partners of Cafe y Chocolate, sat down with Liz from West Passyunk Neighbors to talk about their restaurant. Our food is homemade Mexican, like what your mom would make for you. How long has Café y Chocolate been open? We opened 4 years ago this month. Before that, it was a Mexican-Japanese fusion restaurant called “Cafe con Chocolate". It was an opportunity. Mary used to help the previous owners, and one day they told Mary they were closing. She came home and said, “We can do this”. I thought it was risky but we went for it. They rented the space to us for a while, but now we own it. That’s why we changed the name from Café con Chocolate to Café y Chocolate. How much has the neighborhood changed? When we first opened, there were a lot more gunshots. We weren’t sure about the neighborhood for a while. Now, it’s safe. People are coming from Center City to eat brunch, and people ask about what it’s like to live around here. The rancheros y Motuleños and the molletes. Enchiladas de mole poblano and the enfrijoladas. The enfrijoladas are made with a bean sauce, and they’re just… really, really, really, really good [quoting directly for effect here!] They’re vegetarian, too. We try to make all of our sauces vegetarian. Arturo: The chilaquilas, definitely. Also, the huevos con chorizo torta. Mari: I love the tortas, too! Our tortas are especially great because we make them different than other places. We make them with chipotle mayo and beans, and we use a different kind of bread, so it doesn’t get soggy. Can you tell us about your open mic night? It’s on Tuesday nights from 6-9pm. It’s free to perform, and anyone is welcome. It’s BYOB, so you can bring beer or alcohol. We set up a little area in the back. About 15 people performed last week, but we hope to have more. We want more businesses, especially more restaurants. Someone said, “Why would you want more restaurants here, competing with you?” But more people walking around and seeing the neighborhood will help change the neighborhood for the better and generate business. What was your experience with the SausageFest last year? Surprising. We never thought it was going to be like that. People came up to us and said they loved our restaurant, and it was great to hear that. We are excited for this year’s Fest! What do you plan to serve at the Cinco de Mayo Fiesta? We’ll have a special menu for eating inside. Outside, we’re planning to serve tacos: sausage, chicken and steak. We’re Mexican, and everyone loves tacos! What music will people hear at the Fiesta? From 12 to 2pm, we’ll have a traditional mariachi musician, Marcos "El gallo de Mexico". Then from 2 to 4pm, Bronson Tennis, a Latin musician, will perform with a few other musicians. And from 4 to 6pm we’ll have Digitally spinning. We are very thankful for the neighborhood people and organizations for everything they do. At first, we weren’t sure about this neighborhood, and now we feel like we belong. Cafe y Chocolate is one of the restaurants participating in the South Philly Sausage Fest and the host of the upcoming Cinco de Mayo Fiesta! on Saturday, May 7th from 12-6pm.